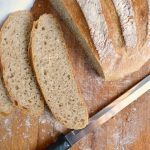 A complete tutorial for making amazingly simple French baguettes – in a food processor or by hand. Be prepared to share it, though, so you don’t eat it all. 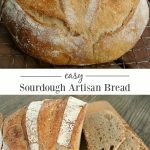 Find other great breads on the Best Bread Recipes page! It’s mixed and kneaded in a food processor, although, like anything, it can be made by hand, too. You gotta love any bread that requires only one minute of kneading. 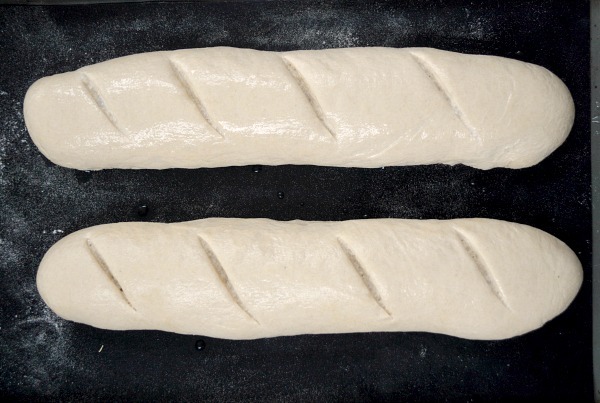 Like our artisan bread, most of the preparation time is spent waiting for the rise. 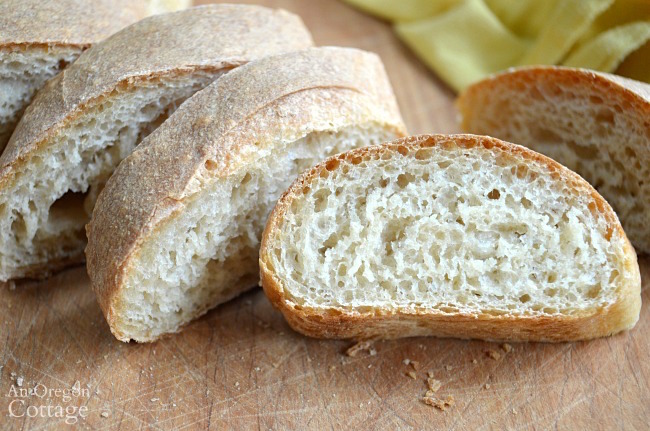 This can be made in the morning, left to rise all day in the fridge, and then shaped for the second rise a couple hours before you want to eat in order to have freshly baked bread for dinner. Love. It is delicious, pure bread made with only 3 ingredients, plus water. In fact this bread is so good, the very first time I made it our family dubbed it “the bread you can’t stop eating” because the four of us ate almost both loaves in one sitting! 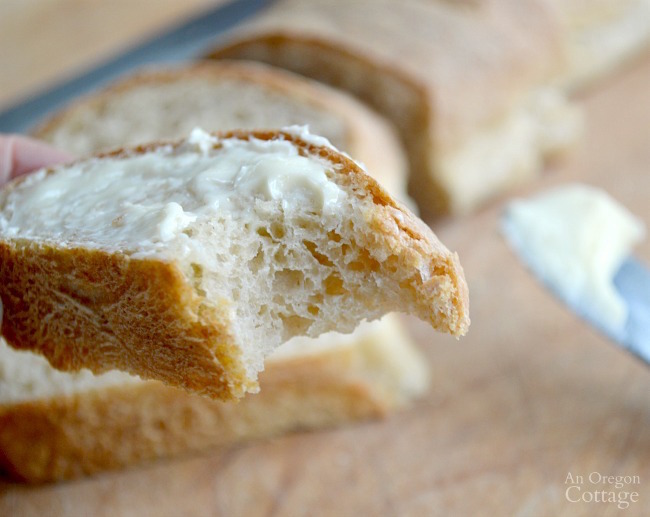 However, I only make this bread occasionally for company or times I’d like smaller bread slices for appetizers like Cheesy Chicken Artichoke Dip because we found that the flavor suffered when I used whole wheat flour. This was pretty curious to me, as I usually can never tell a flavor difference when I bake with whole wheat, but it was unanimous. I want to make the majority of our breads with whole wheat, but this is SO good with unbleached flour it falls into the 20% of our 80-20 healthy eating goals. Life is too short to never have a bread like this again since it has all the other things going for it. 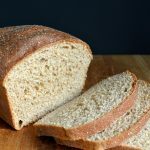 Of course, you don’t have to make it with unbleached wheat flour – you can try it with a combo of whole wheat and unbleached or even full whole wheat bread flour. 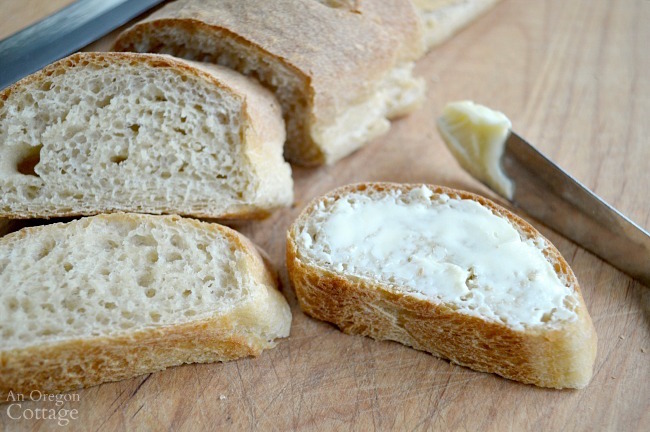 The texture won’t be as light and the flavor will be different, but it’s still good bread! Note: This recipe makes two smaller French baguettes, which is why if fits in a 7-cup food processor. If you’d like to make more, make one batch, start it rising, and then make another (no need to wash the processor- it’s all bread). 1. 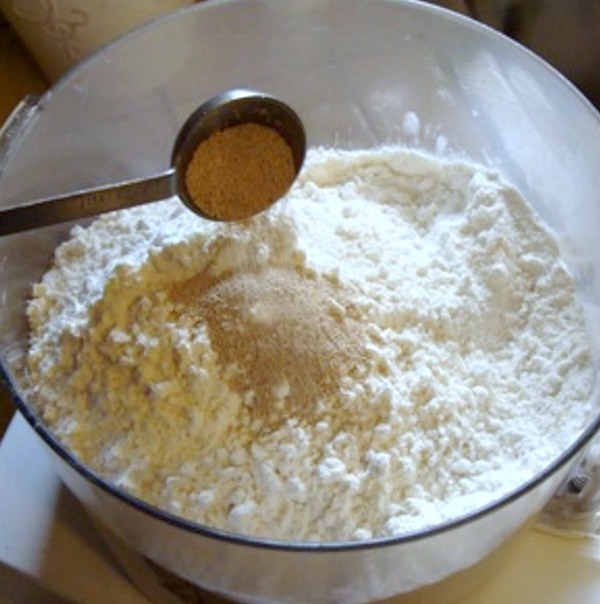 Add the flour to the bowl of the processor (or a medium sized bowl if making by hand). 2. 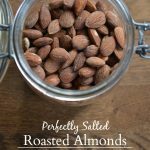 Add salt and instant yeast- not plain active dry. 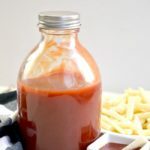 I think it’s also called fast acting or rapid rise, but it’s the type that you don’t need to dissolve in water first and can be added directly to the dry ingredients. Pulse the dry ingredients together to mix. 4. Pour in 1-1/4 cups warm water. Use the warmest water from your tap- don’t try to boil or microwave the water to warm, because it usually gets too hot which will kill the yeast. 5. Mix by pulsing the processor (or using a wooden spoon if making by hand) until all is combined and then running it for a minute until a ball forms. This food processor “kneading” is completely done in about a minute (love it! 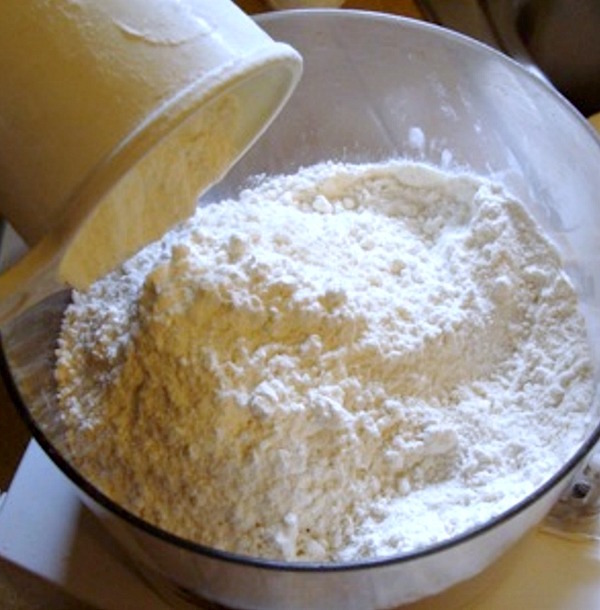 ), but you can also knead it by hand for 10 minutes on a slightly floured surface. 6. 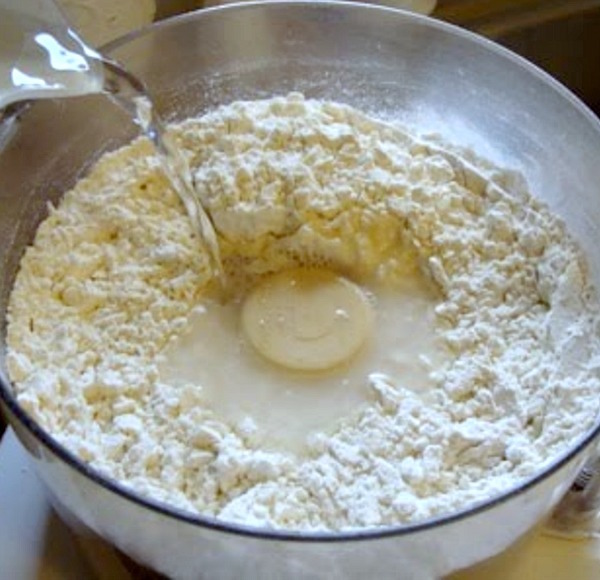 Pull the dough out of the processor onto a lightly floured surface. 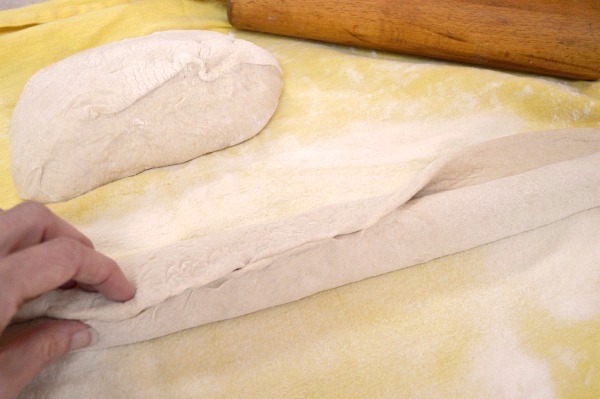 While the dough sticks to the bowl, it should not be sticking too much to your fingers (TIP: this is always the way bread dough should act, by the way- if it rolls out of a bowl without any tackiness at all, that’s a sign that too much flour has been added and the bread will be heavy). 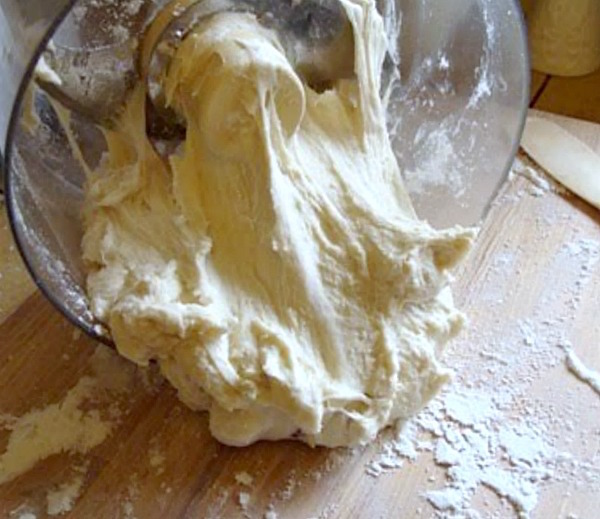 Knead the dough a few times to shape into a round ball. 7. 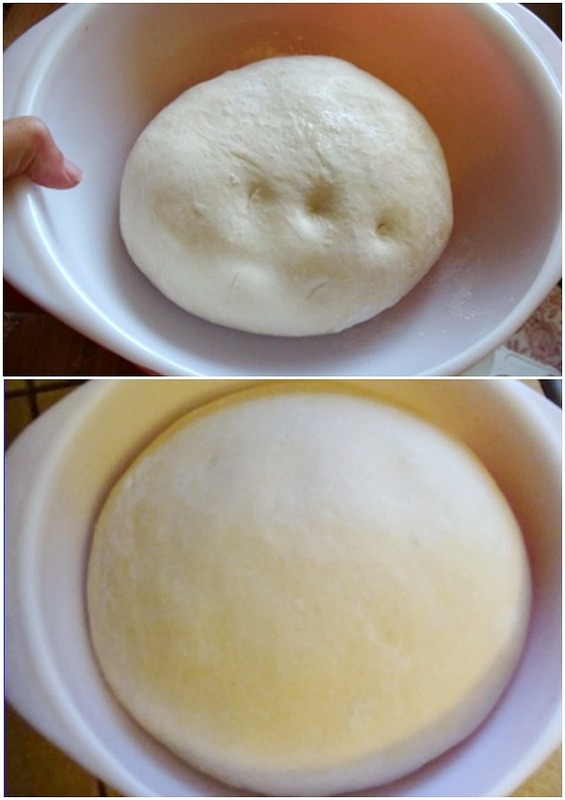 Place the dough in a bowl greased with a bit of olive oil, cover and let rise an hour until doubled. Make-Ahead Tip: At this point you could also place the dough in the refrigerator instead and let it rise slowly until about two hours before you want to serve it, which is great if you’re going to be gone most of the day or you’d like to prepare in advance for guests. 8. 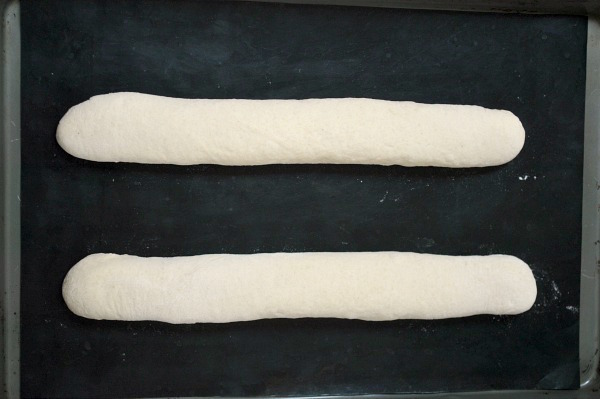 The bottom photo above is what the dough should look like after the first rise. Punch it down (my kids always loved this part!) 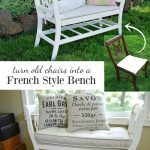 and let it rest while preparing your surface for shaping. 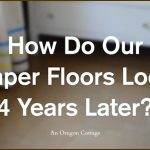 Using a rolling pin or your hands, press each half into a long rectangle (between 10-12″ long and 5-7″ wide) and then roll up, pinching the end to seal. 10. Place seam side down on a lightly oiled, parchment or silicone lined baking sheet (I use these black liners for better browning, also shown below). If you like cornmeal on the bottom of your bread, dust with a bit of that before placing the loaves on the sheet- I prefer mine without. 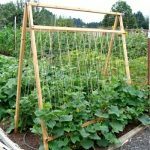 You can see that they look pretty thin now, but they will rise nicely. 11. Cover with a towel (since I roll out the dough on a towel, I simply use that to cover them), and leave to rise for an hour. Start preheating the oven to 450 degrees 15 minutes before the rise is complete. 12. Slash the tops if you’d like (it’s not necessary since these don’t rise a lot more while baking but I like the look). Lightly brush the tops with water before putting them in the oven to help the crust get that crispiness we love in a good baguette. 13. Bake for about 20 minutes, until the crust is firm and golden brown, turning as needed for even browning. Let cool on a rack 10-15 minutes before cutting. If you can wait that long. See? I wasn’t kidding about the simple. 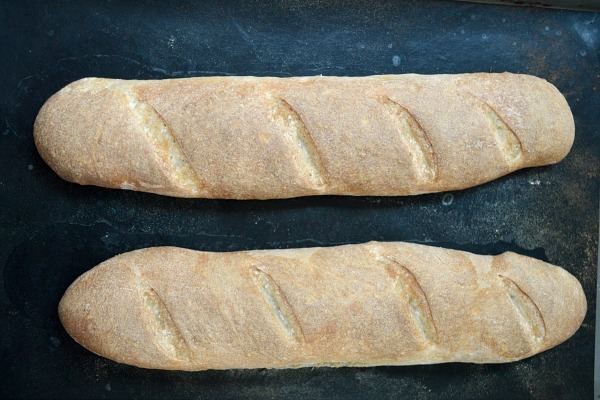 Make these French baguettes. Please. 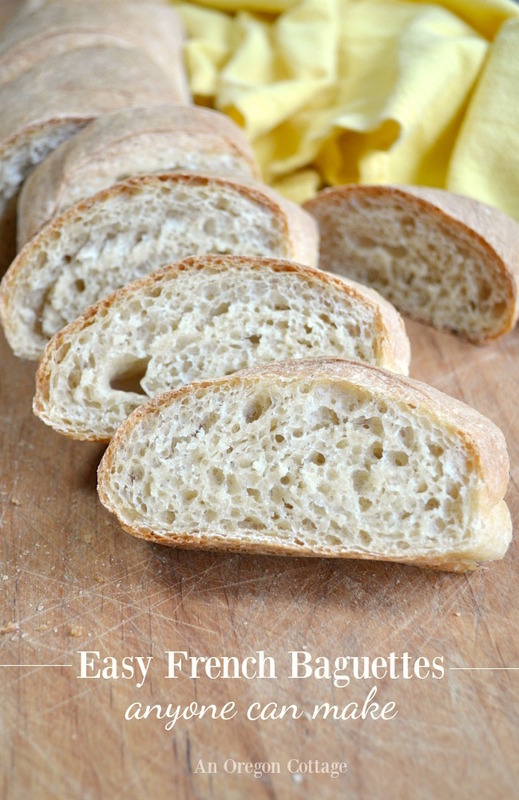 Click the arrow for the full printable French Baguettes recipe + more easy bread ideas! Me again. Sorry to add that the Simple French Baguettes link in the Winter menu download does not go anywhere. But I did find it. Thanks again, Heidi! I’m glad you persevered. 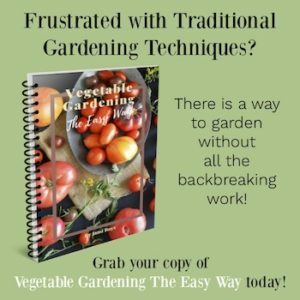 🙂 The eBook is several years old now and I don’t have time to update it, so I’m glad you were able to find the recipe!